Northeast Security Solutions, Inc. stands behind its work and delivers security products that effectively and efficiently reduce our customers’ risk to ensure you sleep soundly at night! We are a one-stop security company, fully experienced in both mechanical and electronic security products. This saves you time and money, and avoids “buck-passing” between suppliers. 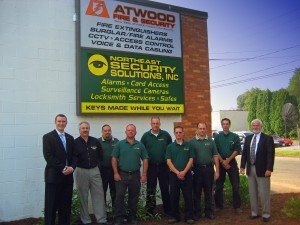 While many of our competitors focus on just one product in security, we take a unique and integrated approach by bringing together mechanical security products such as locks, door hardware, and safes with electronic security products such as alarms, security cameras, intercom systems, and electronic card access control to enhance your security. We don’t provide a “cookie cutter” system and make it fit to your property. Instead, we design your solution to cater to your building, your risk tolerance level, and your budget. “Good Security” comes from having multiple layers of defense and most security companies don’t provide all the security services and equipment you need. Surveillance camera systems provide monitoring of specific areas to discourage theft, and they record the intrusion as potential evidence for prosecution. However, by themselves they only record an incident and while they can be a deterrent they aren’t an effective prevention tool by themselves. This is why it’s so important to take a comprehensive approach to security and to utilize a provider that knows the strengths and weakness of all the possible security tools available. We’re your “Director of Security” without the payroll costs! We have the experience to identify weaknesses. We’ll act as your unpaid “Director of Security!” One call to us will get the job done! We can ensure that all aspects of your security systems will work together and that you will be delighted with the results. Click here to contact us today! Why do we recommend high quality goods and services? We understand the overall cost of managing and implementing security. By recommending high quality goods and services, we offer the most cost effective solution for your long term benefit. Northeast Security Solutions, Inc. has been providing mechanical and electronic security services for our clients since 1988. (See our “Company History.”) We’ve seen what products stand the test of time and as a result we can recommend products that won’t generate numerous costly service calls. You can always find a cheaper product. But when you need to keep servicing your “cheaper product” on a regular basis, it becomes clear that investing in quality products from the start saves money in the long run.